The guys from "A Better Place" continue their adventures in this volume. Shawn wants a boyfriend, but fears his father's reaction to learning the truth about him. Dane wants a soul mate, but what if approaching the guy he likes ends up in disaster? And Brendan realizes he and Casper will never be at peace until Brendan confronts his father. 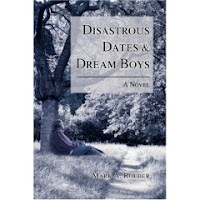 "Disastrous Dates & Dream Boys" is a work of passion that Mark published himself. It's the sixth book he suggests reading in his THE GAY YOUTH CHRONICLES series.